How much critical CSS can be inlined before there is a negative performance impact? I've heard that to avoid render-blocking issues, it's good to inline critical CSS directly in the <HEAD> tag by including the actual CSS in <STYLE> tags, and then load the rest of the CSS asynchronously. At the other hand, I read it's bad to inline too much CSS. Is there some limit for critical CSS after which it becomes a negative performance impact? As of 2011, you will see the first drop in page performance after 14.6 KB has been sent. For the speediest page, all of your HTML code from the first byte up to and including the critical CSS should fit within this amount of data. 14.6 KB is the size of an HTTP server's initial TCP congestion window assuming a default TCP IW value of 10 (which was agreed on for major web browsers in RFC 6928). This 14.6KB payload represents how much data the server can send to the client before hearing acknowledgement that the data was received (aka before waiting for the first network round-trip). 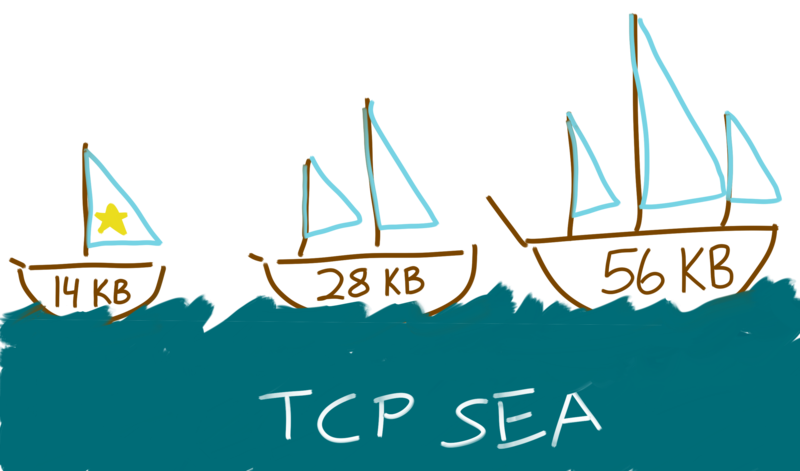 If you think of the HTTP connection as a series of boat expeditions from the server to the client, 14.6 KB is when the first explorer's ship is full, and the rest of the HTML has to sit around and wait for the cargo ships. So if the beginning of your HTML - up until the end of your critical inlined CSS - is less than 14.6 KB, that is optimal. Due to the way TCP congestion control works (doubling the amount of data sent as each burst is acknowledged), you can send 98 KB (14 KB + 28 KB + 56 KB) within 3 round-trips - so Google recommends that all above-the-fold content should be renderable with the first 98 KB of the document for mobile page speed reasons. In short, 14.6 KB is the upper limit for critical inlined resources to fit within the first RTT. To fit within three RTTs and Google's recommendation, the cutoff is 98 KB. Not the answer you're looking for? Browse other questions tagged seo html page-speed or ask your own question. How to make my page load faster? Is there any negative impact with similar page titles and descriptions on similar sites? Sitemap time stamps = negative SEO impact? When is eliminating render-blocking CSS worth it?